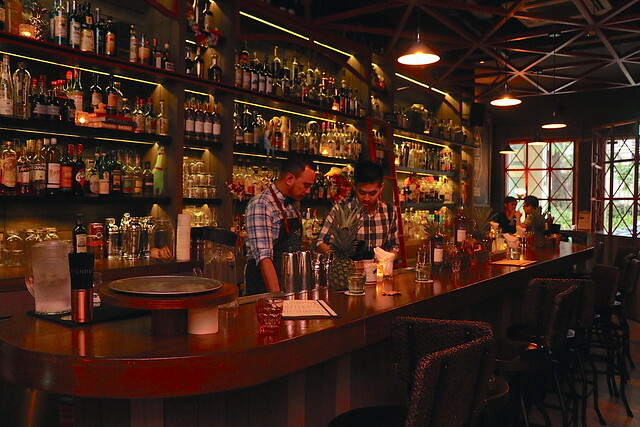 With over 100 types of rum sourced from all over the world, Sugarhall is a pure temple of rum adoration. There are all styles from hogo-rich (still funky from fermented molasses) English style rums from the British Caribbean Islands to the more refined Spanish style rums found in Cuba, Guatemala and Panama. There are over 18 playful cocktails here, each designed to match the food served. 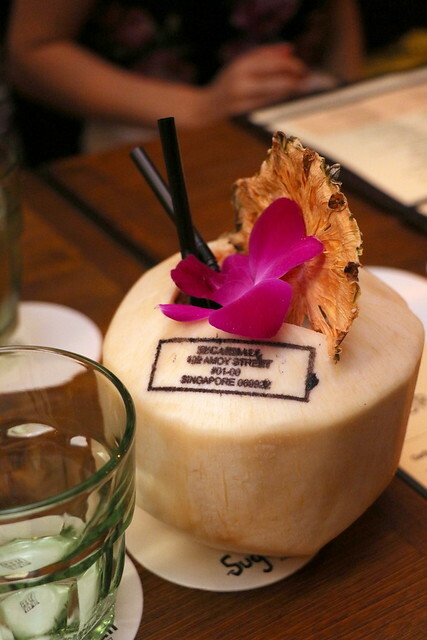 To help diners pick the right types, the cocktails carry a tag to describe their flavour and characteristics. I started with a coconut daiquiri, which I absolutely enjoyed (right down to scraping the coconut flesh). The cocktail is on the sweet side, easy to drink and not too strong (perfect for me). In terms of the food, there are a few starters which were stellar. This was a Wow dish for me. 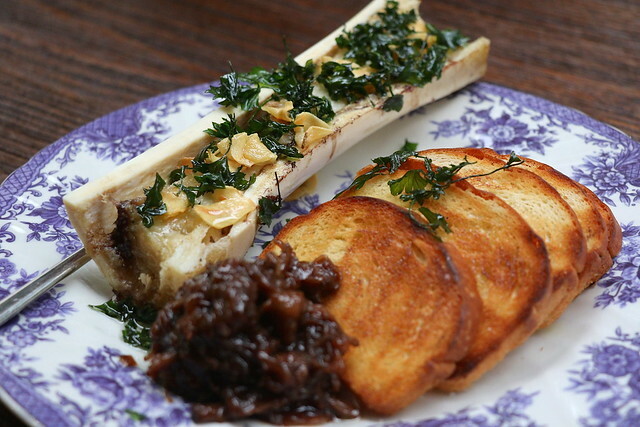 That's surprising because I'm not a fan of marrow actually. But I loved how buttery good this was on the toasted brioche. The garlic crisps and fried parsley on top added flavourful crunch. One of my favourite dishes of the evening. They make everything inhouse as much as possible to control the quality and taste - breads, sausages and sauces. 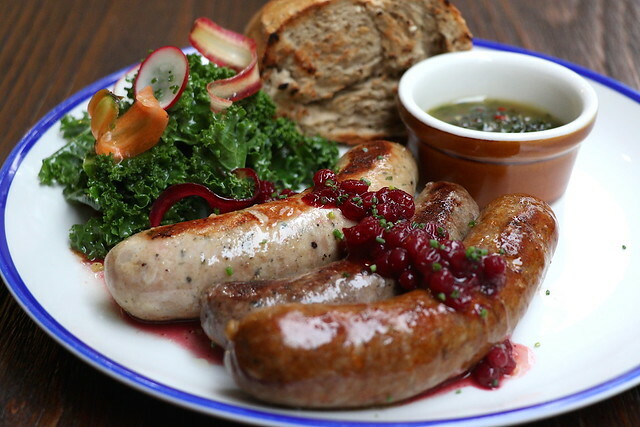 These housemade sausages taste as good as they look; I particularly like the spicy lamb one. We also had the scallops. 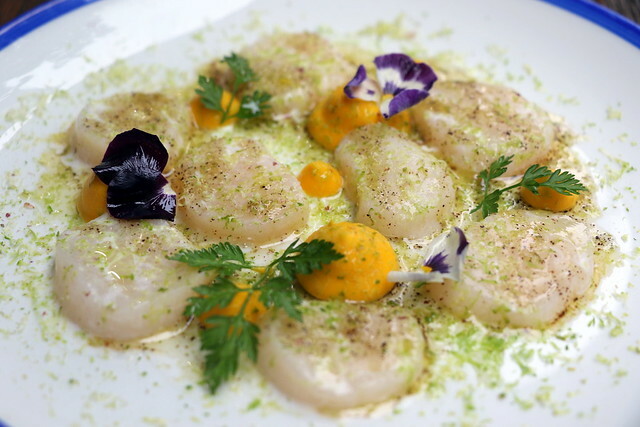 While fresh, these were seasoned very mildly, so you could taste the natural sweetness of the scallop. But I think some acidity would help alleviate this dish. Now for the main event. 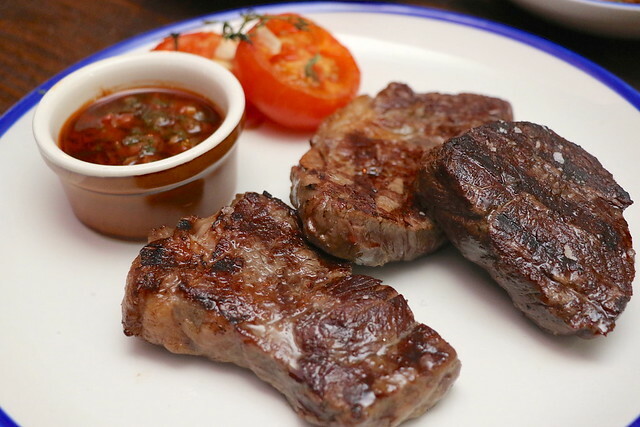 From the Parilla grill, come the steaks which are supposed to be the highlight of the steakhouse. The steaks are also available separately, but this platter gives you the best value. The John Stone beef is grass fed, so it's leaner than grain-fed varieties. It's also more concentrated in flavour thanks to dry-aging. The tenderloin surprisingly fared the best. The Angus Black Onyx is grain fed for over 270 days on premium vegetarian grain feed. It is prized for hearty flavor and marbling (the beef is guaranteed a score of MB3+). After a while, I couldn't tell which was what, but the tenderloin stood out the most. Normally tenderloin is tender but tasteless, but this one was nicely beefy and robust while not being too soft. The chimichurri goes really well with the steaks. This one is more smoky than the one with the sausages. This is the house bestseller, and has been on menu since day 1. Once we bit into it, we understood why. 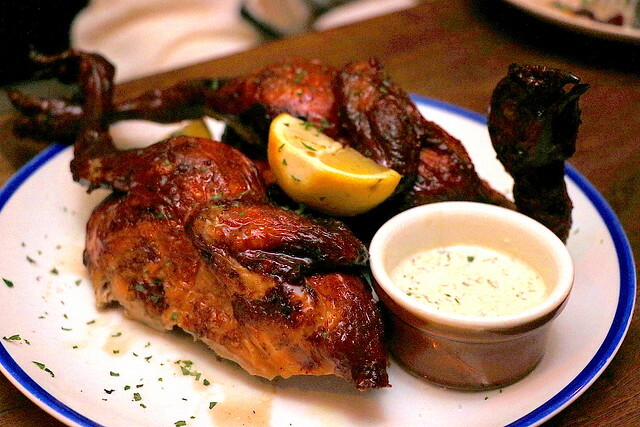 The bird is so moist, tender and aromatic, having absorbed all the flavours from hours of brining. It's giving the steaks some real competition. Certainly, if you don't take beef, try the chicken. Some side dishes deserve mention. 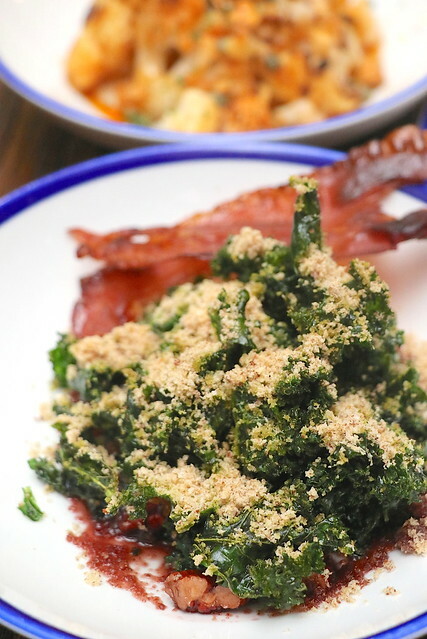 The crispy sauteed kale is delightful along with candied parma ham and red wine dressing. 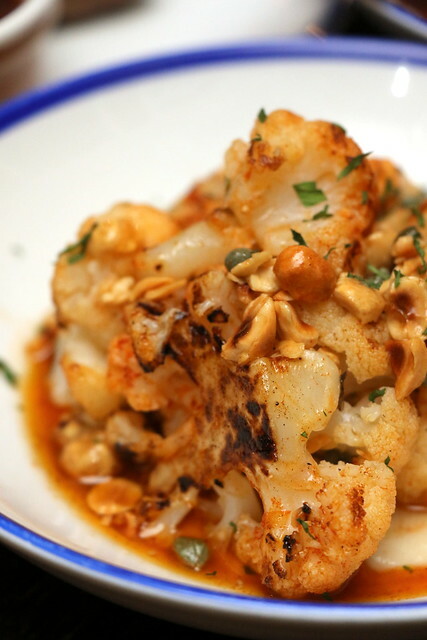 Some people like the grilled cauliflower, but I found it a little underwhelming. You really have to toss it well so that you get dressing and hazelnuts in each bite. There isn't a lot in the way of desserts. The cocktails probably are the best desserts here. 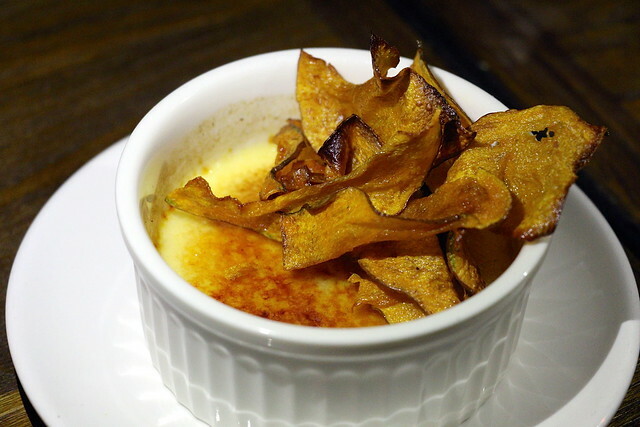 Love the pumpkin chips (well, anything crispy gets me) but the creme brulee barely tasted of rum or pumpkin. It was smooth and pleasant, don't get me wrong, but just a little plain. This was not bad. I forgot to ask if they make their own ice cream, but you can really taste the foie gras. 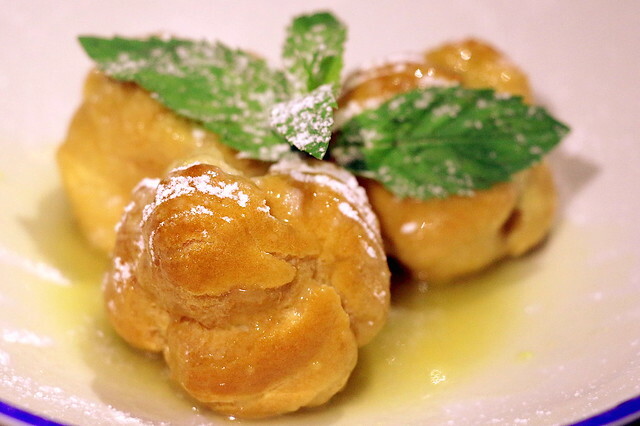 The only letdown was the choux pastry which would have been better freshly made or kept warm. Imagine toasty light pastry and cold ice cream...that would be spectacular. Sugarhall sits right next to sister establishment to Jigger & Pony. The atmosphere here is fun, casual and informal. I would come back to try the Hangar Steak, and maybe the pork sausages.